Nashville Bed and Breakfast at The Timothy Demonbreun House, Tennessee. An elegant restored 1906 historic mansion, offers luxury accommodations near downtown Nashville. Great accommodations for weddings, receptions, dinners, gala events and family retreats with pool, spa, and recreation area. 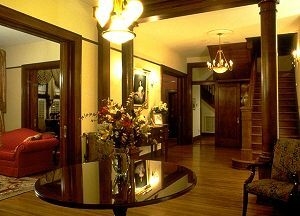 The Nashville Tennessee bed and breakfast mansion has already been the site of many special events including: newspaper and feature stories; video and photo shoots from such notables as Garth Brooks, Kenny Rogers, Bank of America, Cracker Barrel and The Tennessean. The home was also chosen as one of Channel 2 News' "Ultimate Dream Homes".